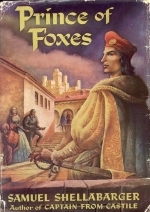 Prince of Foxes , by Samuel Shellabarger; Little, Brown & Co 1947, 433pp. As soon as I became a parent I started stocking the house with books beloved at any point in my life, ready for my progeny to read. Recently, I expounded this theme by showing off one of Ross's book-cases to my friend Laurie, and pulled out Prince of Foxes. Ross had not read it yet, I told her, but I shared my admiration for the protagonist, Andrea Orsini, with my college room-mate David . And the eye-gouging scene (continued I) was something one would never forget. As is her way, Laurie took the book to the guest room and finished it before you could say gentilhomme Bayard. She then proceeded to buy all the Shellabarger first editions on Ebay, a course that I recommend given the naff cover of the reprint on Amazon. She even bought a bootleg DVD of the movie, starring Orson Welles and Tyrone Power, but has not yet told me if that was a worthwhile purchase. All this activity made me decide to reread the book. Andrea Orsini is the fox, a man of many stratagems and talents, including painting. He begins the book in the employ of evil Cesare Borgia, and immediately meets Camilla Baglione, the very young wife of Varano, lord of Città del Monte, which town Orsini plans to own. Though Andrea has dallied with earthy Angela Borgia, he soon falls in love with Camilla, and this love changes him, and complicates his life. Andrea's would-be assassin, arch-ugly Mario Belli, becomes his companion, and perhaps his friend. Because I remembered every delicious plot twist, it was the romance that stood out for me on rereading, making the book seem simpler than when I read it as a young man. But Shellabarger was a scholar and provides none of the cringeworthy moments of most bodice-rippers. So I am tempted to try Captain from Castile next. A dangerous side-effect of this book is that it will make you want to want to visit Italy again soon. I cannot read of Perugia without thinking of P in the red-velvet dress that she bought there. And Città del Monte is right near Foligno, where we rented a villa with P's mom when Ross was a cute blonde toddler. Our landlady, who looked like Barbara Streisand, recommended on the first night that we head into town for dinner, late as it was. Our only common language was bad French, and she seemed to be saying that Foligno was having a festival that involved competing guilds having bake-offs (googling around, I see that this must have been the Quintana - we never knew there was jousting!) But the town, which seemed about as picturesque that evening as Worcester, Massachusetts, was shut tight. We were about to give up, when my nose shot in the air, and I followed it down an alley to see a scene from Fellini: buxom wenches serving platters of snails and pork and pasta on long trestle tables in halls painted with silly sayings in Latin. There was even a guy in tights singing absurd songs, which Ross enjoyed. Yes...back to Italy.....I have always wanted to see the Villa Orsini, for one thing...Coincidence? My dad wrote: Anything that makes you want to go back to Italy (especially with grandparents) is a good thing. Joe wrote: Just a quick note to tell you how much I enjoy and appreciate all the work you are putting into these reviews. I love clicking on the various links and learning more about your topics. I read Captain of Castile when I was a teenager. I used to stay with my grandmother overnight a lot after she was widowed and she had a great collection of historical romances. Of course that is so long ago I do not remember anything more than the title. That would also be true if I had read it yesterday.